Even though this is one of my favorite dresses with its wide bohemian sleeves and lace scallop detailing, it has been sitting in the back of my closet for the last year. It's typically a dress I would wear to an event but instead I paired it with brightly colored oxfords and a statement necklace to dress it down for a casual dinner. Oxfords are simple, chic and pull any outfit together. I prefer to pair them with a dress for a masculine yet feminine edge! 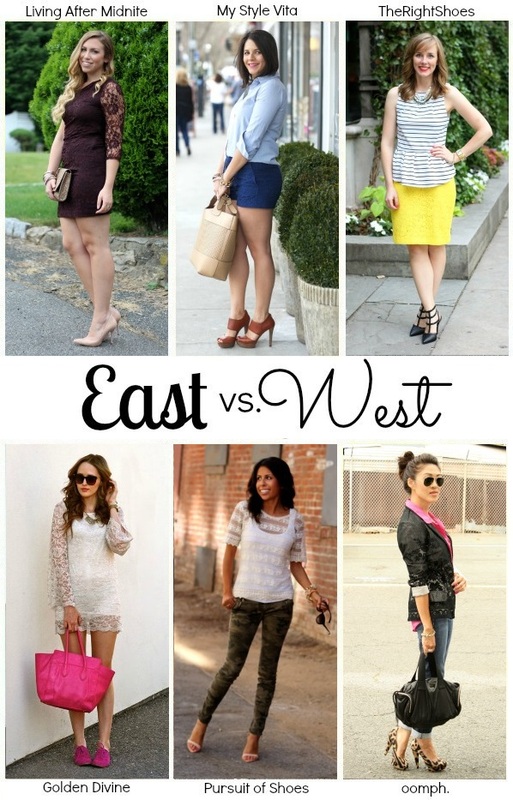 I'm sad to say, this is the final series in the East vs. West challenge. It's been so much fun with these gals showing you how to style denim shorts, nautical stripes and metallics. This week we're showing you a summer trend that you're seeing everywhere, lace. See how these bloggers each styled their own: Jackie from Living After Midnite, Jessica from My Style Vita, Tracy from The Right Shoes, Ashley from Pursuit of Shoes and Becca from Oomph. Seriously in LOVE with this dress!!!! It was so much fun working together, so glad we got to do this! I love that the sleeves are wider. It seems to me that all lace dresses have been looking alike, but not this one. Love the shoes you picked to go with it too! this is too cute with the pink oxfords!! love the look.